2017-18 will mark Ann Vogel's twenty sixth season coaching cross country and track and field at her high school alma mater, West Liberty-Salem. She fell in love with the sports in 1974 watching her older brother, Butch compete for the school's programs under Coach Ken Lehman. She became a member of the first Big Orange girls cross country team in 1982, and earned All-Ohio honors in track and field in 1983-85 under coaches Alan Keirn and Earl Zilles. In 1992 she began her coaching career under the guidance of long-time West Liberty-Salem coach, Larry Steider. 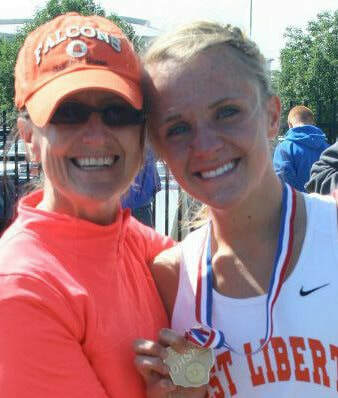 During Vogel's tenure at West Liberty-Salem, she has had six teams qualify for the Ohio High School Athletic Association State Cross Country Championships (2000, 2009, 2010, 2011, 2012, 2016). Vogel has coached six All-Ohioians, eighteen Academic All-Ohioians, one state champion and has led her teams to twenty six conference titles in cross country and track and field. In 2009 and 2010, Vogel was named the Southwest Ohio District Cross Country Coach of the Year, and earned West Central Ohio Conference Coach of the Year honors six times from 1994-1999 for cross country and track and field. Vogel is currently the co-race director for the BOSS Summer Run which started in 1977 and race director of the Liberty Half Marathon. She also oversees the Ohio Caverns Big Orange Alumni 5K and the Big Orange Elementary Fun Run. She is passionate about the West Liberty running community and wants to continue supporting its rich history of outstanding runners. Vogel and her husband, Jason live in rural West Liberty. They are the parents of three grown children, Adam, Matt, Meghan, and the best dog in the world, Scout.